Aim: Start by looking at the work of Elizabeth Blackadder (see vimeo.com/25711526). 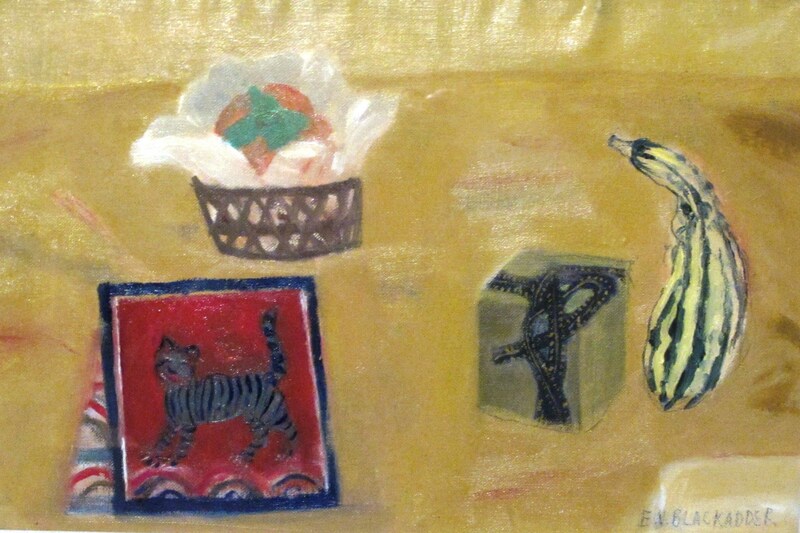 Elizabeth Blackadder works extensively with still life. The objects she works from are often quite small and her compositions leave a lot of space around each object. The space is not ‘background’, however, it’s a vital component of the composition and the formal properties, especially the colour and scale, are used expressively. A small brightly coloured object might be balanced by a very large square of a darker colour, for example. Blackadder sets up still life subject matter in her studio in such a way that the still life is almost a collage in its own right. By looking at how Blackadder builds and works from still life, you’ll be able to experiment with using colour, composition and detail to create an image which uses the whole support, rather than relegating some areas to ‘the background’ or leaving them unworked. Method: Make a still life by pining up coloured fabric. Suspend light, brightly coloured objects onto the fabric. Make several drawings in colour, selecting areas and elements and refining to explore the composition. Try bringing some lines or shapes in from the edges; lay a sheet of paper behind the one you’re working on so that you can begin drawing off the page and enter the drawing from the side. Reflection: Do you feel that you managed to instill energy or life into the whole drawing, or does it run out of steam towards the edges? Now look at the work of Henri Matisse and write some notes in your log about the two artists. What are the similarities and differences between them? Which artist do you feel more affinity with? Consider making a second piece in response to Matisse’s more sophisticated use of space and pattern. Elizabeth Blackadder and Senior Curator Philip Long talk about Blackadder’s work in her garden and home studio. Blackadder’s Still Life paintings explore the nature of the subject but from a short distance. She does not close in to see the object close at hand by observing dispassionately from a distance. Her objects in these still life’s explore perspective and treat the picture plane as a total space to be used to ‘display’ the subject. She uses strong colours to create strong patterns with both the subject matter and the depth of the colour and tone. When using the space she experiments with conventional perspective and starts to abstract from the objects using colour and form to dominate the design rather than the detail of the objects. She achieves this sense of distance observation by setting the objects with plenty of space surrounding it. However, this space is not emptiness but a stage for her to place the objects and play out her design. The space and continuous tone around an object allow her to depict repeating patterns and motifs. The colour of the objects and background create a rich and subtle colour and tone. Blackadder’s botanical drawing and paintings often leave the surrounds empty of any detail or colour or indeed a mark. She produces a pure white unblemished background to show of the prize – the subject a flower (s). the influence of Japanese prints and works is evident in her uses of perspective and space in her works. Her still life’s often strengthen this link to the Orient by display kimonos and other Japanese cloth and tapestries. Matisse was one of the great colourists. 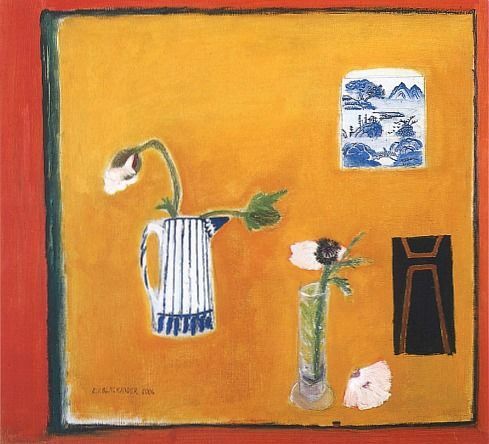 He sought to use colour as the foundation of his expressive and decorative works including still life. He generally avoided the depiction of modelling or shading in his works to give an object volume and structure, instead using contracting areas of pure bright unmodulated colour. Blackadder observes from a distance placing her objects in a context which maybe surrounded by other isolated objects or in a relatively plain coloured background. She uses this empty space to balance the objects she has placed. However, Matisse takes several steps towards the objects and observes from close. His gaze (the viewers) is often so close it loses the edges of the object or cuts them in half. Comparing them to party-goers – Blackadder is the shy recluse gazing from the far side of the room whilst Matisse is in the thick of the party in the middle with lots happening around him. Rather than seeing objects from a wide context he observes from practically the same position. Matisse, using the analogy above I prefer to be in the thick of the party rather than on the fringes. The dynamic nature of Matisse’s composition and object placement along with the tight cropping to me makes for a more interesting painting, composition and work as a whole. Wider composition to reveal more background indicating possible cropping marks. The wide views (early in this series) give a pleasant easy on the eye arrangement of the objects on the cloth. However, the tight cropping and change to a bolder medium (Inktense blocks) instils a sense of dynamism and energy to the drawing. Tight cropping and the large scale of the work place us eyeball to eyeball with these objects, indeed we need to turn our head to see the object edges. This exercise of placing the objects on the cloth resulted in a very narrow depth of field; the front to back perspective was only the width of a tennis ball. I would have liked to have a bigger range of depth in the picture plain. I re-visited this exercise after writing this to do a Matisse-like drawing including a patterned object along with patterned backdrop. The result of this is below. Using such a well patterned object and back drop is not something I would usually do as I usually feel such heavily patterned objects make the work too busy looking. However, I am pleased with the outcome of Matisse-like drawing opposite. This still life was an arrangement of my wife’s blouse draped into an L-shape with a bowl, jug and stoppered jug. The busy nature of the background and the base of the arrangement lends a unity to the picture which is further enhanced by the red jug having colour echoes in the patterned bowl and the background (blouse) also having colour echoes in the smaller jug. Fig 6: Vimeo (2017). Elizabeth Blackadder: In the Studio 1 (2011) At: https://vimeo.com/25711526 [Accessed 20 Feb 2017]. Fig 7: Vimeo (2017). Elizabeth Blackadder: In the Studio 2 (2011) At: https://vimeo.com/25711526 [Accessed 20 Feb 2017].